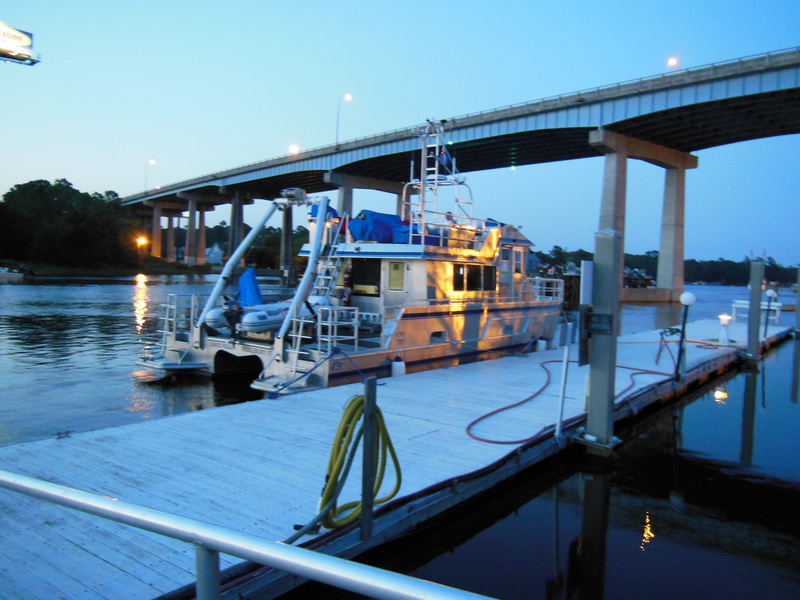 Yesterday around 3:30 the R/V David Folger was repaired and put back in the water. Click the video link below to catch the action. She had to “soak” overnight, and the AIS showed her sitting at the dock this morning and after an hour of sea trials she headed on her journey once again ~ 11 o’clock. 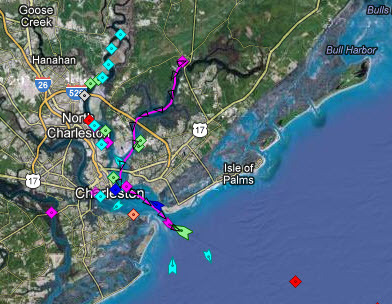 She has left Charleston Harbor area and appears to be out into the coastal ocean area. Neptune listened to our wishes and the crew had calm seas and made good time. 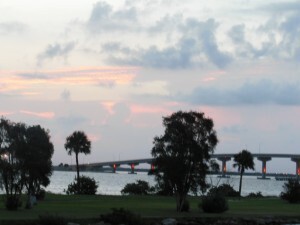 This evening they are at Harbourgate Resort and Marina in North Myrtle Beach, SC. Today the bearings, shaft, and propeller are being installed at the boatyard, and then the R/V David Folger will be put back in the water. However, it will take 24 hours of “soaking” for the hull to realign itself before shaft alignment and sea trials can be completed. If all is well, the Folger will be underway by noon on Friday (the 31st). Keep the positive vibes coming that this will happen! In the meantime, we (Tom, Chris, and Richard) have all worked on other issues that we had already discovered, such as dealing with the dead band in the rudder assembly and the non-functioning water cooler, cleaning barnacles off the transducers, repairing the speed log (which mechanically measures boat speed through water), sending the malfunctioning Knudsen echo sounder deck unit back to the company, making modifications to the wheelhouse, and programming display parameters, just to mention a few. We will very relieved to get the Folger on the water once again. Pat won’t be able to join the crew because she needs to head back to Middlebury for her First Year Seminar next week, so you’ll be hearing more from me as the journey proceeds. 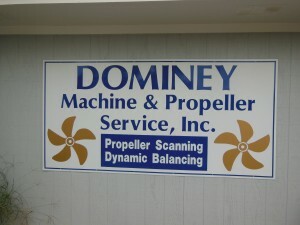 Tom met the owner of Dominey Propeller (Tyler) in Brunswick, Georgia at 8 AM. Measurements on the shaft and propeller showed them to be out of spec, but correctable. By 11:30, both the shaft and propeller were back in the van and on their way back to the Charleston City Boatyard. Tyler was extremely personable, and besides his business he does metal artwork. 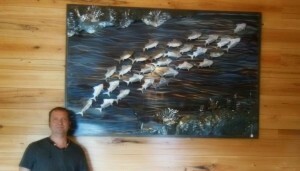 Check out the photo! The R/V David Folgerwas hauled out this morning and when it was set on blocks, it was apparent that the intermediate bearing (closest to where the shaft comes through the hull) was damaged along with slight damage to the propeller. After consulting with Denis Dupas and Nate of All American Marine (where the boat was built), the crew determined that the standard cutlass bearing could be used instead of the bearing that had been in service, which is made of highly specialized Vesconite material that is manufactured only in South Africa and would take two to three weeks to obtain! 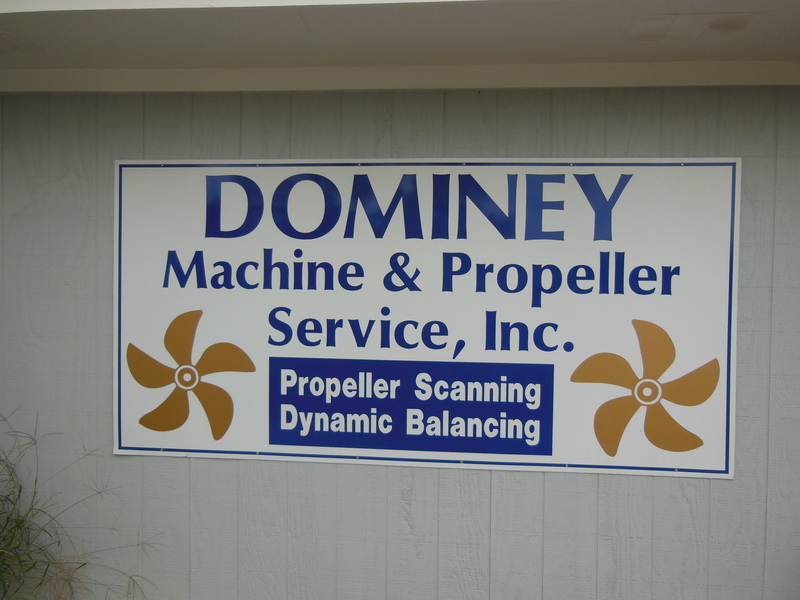 The only place where both propeller and the shaft could be handled was at Dominey Propellers in Brunswick, Georgia. 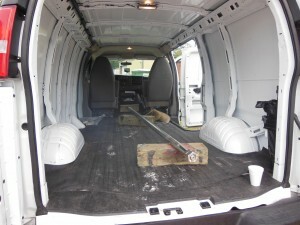 Therefore, while the propeller and shaft were being removed, Tom rented a cargo van, dropped Rich and Chris off at hotel, and set off to Dominey’s with shaft and propeller. It is always amazing, the kindness of people. Last night when the crew got in, there was only one place to get food, and it was technically closed. 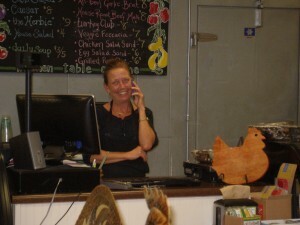 However, Maria, the owner of “Our Local Foods,” was still at the café when we called, and she let us come in for a quick dinner. The people at the Charleston City Boatyard have also gone to extra lengths to assist us and help the crew to get back on their journey. Day seven – a delay! We started out early from Charleston, and the AIS is tracking us fairly well. However, you can see that we stopped for a while along the ICW, and in fact we got stuck on a sand bar! 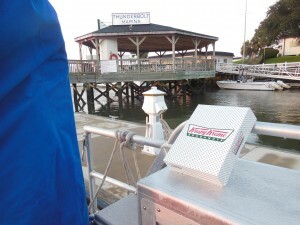 These shifting sand and mud bars often cause problems for vessels using the ICW. 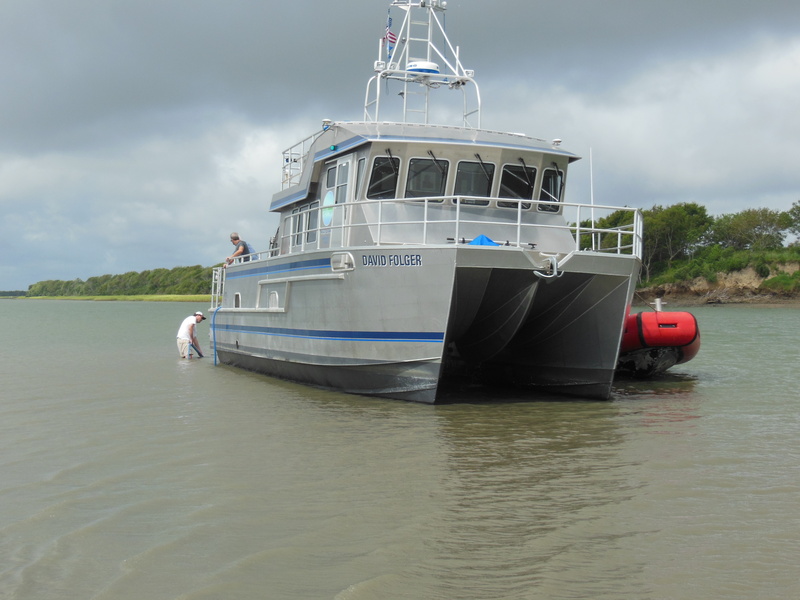 We spent four hours waiting for assistance but finally got pulled off the sand bar and got underway again. After we had gotten started and as we were cleaning up the back deck, we noticed a vibration in the starboard propeller shaft area. 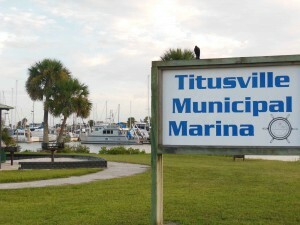 We decided to turn around and stop at a small marina. 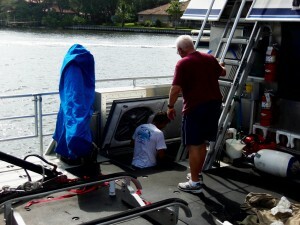 Tom and Chris dove under the Folger for a visual inspection of the hull and propellers but could see nothing amiss. SO…. 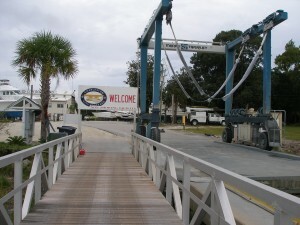 we need to head to a larger marina to have this looked at, since we can’t run on one engine. This is really discouraging, to say the least, and it could mean a large enough delay that I won’t be able to join them on the trip north! The Folger has arrived at the Charleston City Boatyard as of 6:30 PM. Stay tuned for further updates. 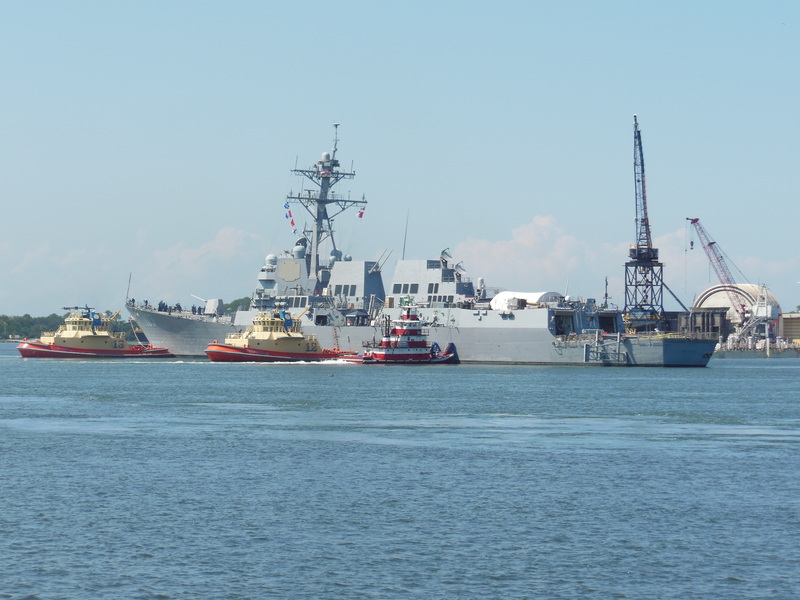 Click below for video of the Folger being towed. and estuaries. Time spent during the day varies from being able to look at the scenery to intense time spent trying to get the equipment, software, and computers working and integrated. As always, meeting people along the way is a true pleasure. Thunderbolt Marine has a custom of giving each vessel a small box of “Krispy Kreme” doughnuts in the morning. They have been doing this since the 1940s. We hope to reach Charleston, South Carolina by tonight. 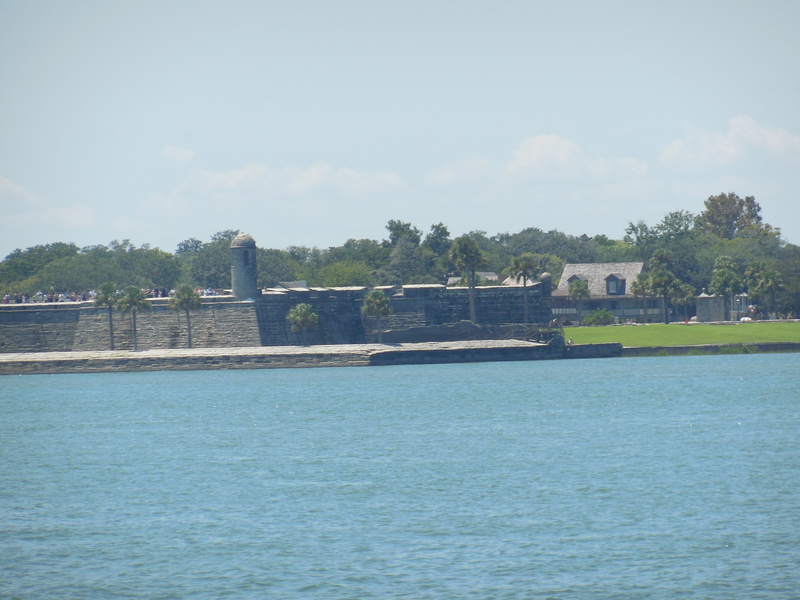 Click on the link below to see a video as we passed Hilton Head. Travel continues northward today. Though traveling along the ICW is quite beautiful, there are shifting sand and mud bars to contend with. Yesterday while passing Jacksonville, Florida, we saw tugs trying to get a Navy ship off of one of these sand bars. 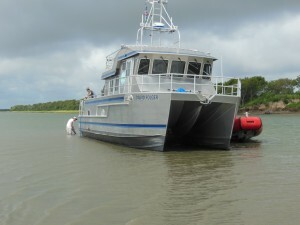 Unfortunately, we encountered a sand bar ourselves and then got delayed as we cleaned out filters, etc. We made port at Thunderbolt Marina, near Savannah, Georgia. The journey continues. The R/V David Folger left Titusville, Florida at 7 am this morning and is still moving northward. 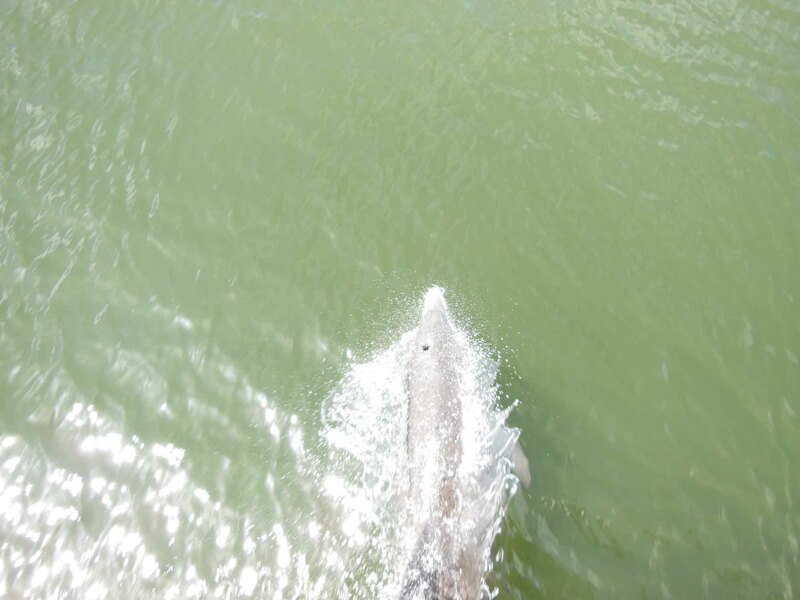 At noon, she was passing Daytona Beach. 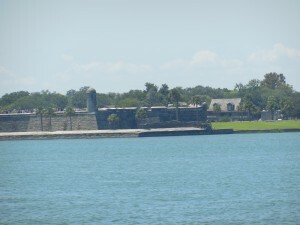 As we passed by St. Augustine, the oldest city in the United States, we got to see the Castillo de San Marcos fort. 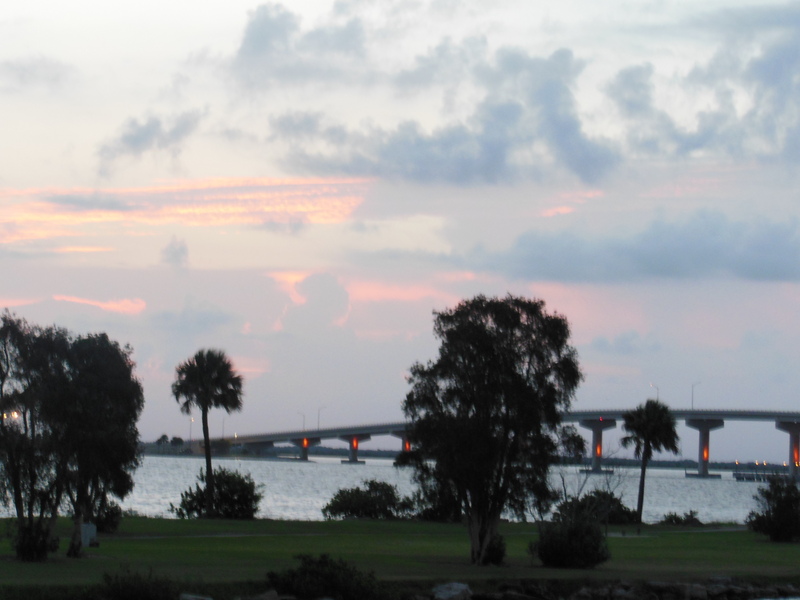 The Folger arrived at Fernandina, just north of Jacksonville, Florida, for the evening. 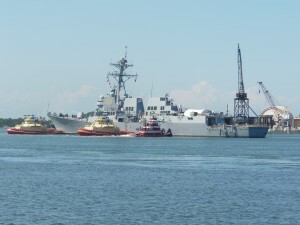 Click on the video link below to see the Folger forging north on the IntraCoastal Waterway. After a brief pause to service the engines this morning, the R/V David Folger is traveling along the Intercoastal Waterway (ICW). Progress northward varies with the speed allowed within the waterway. 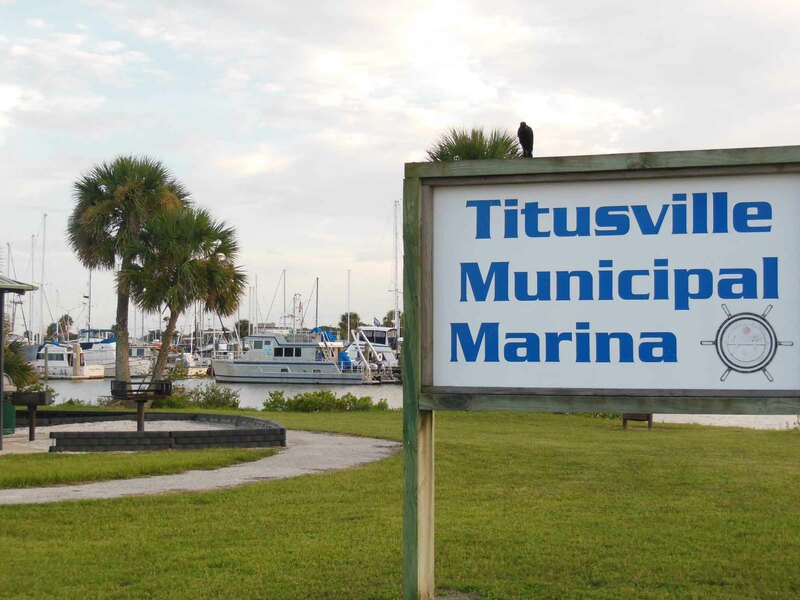 She sailed northward to Titusville, Florida, where she berthed for the night. Note to those looking for the Folger on the AIS traffic marine system. 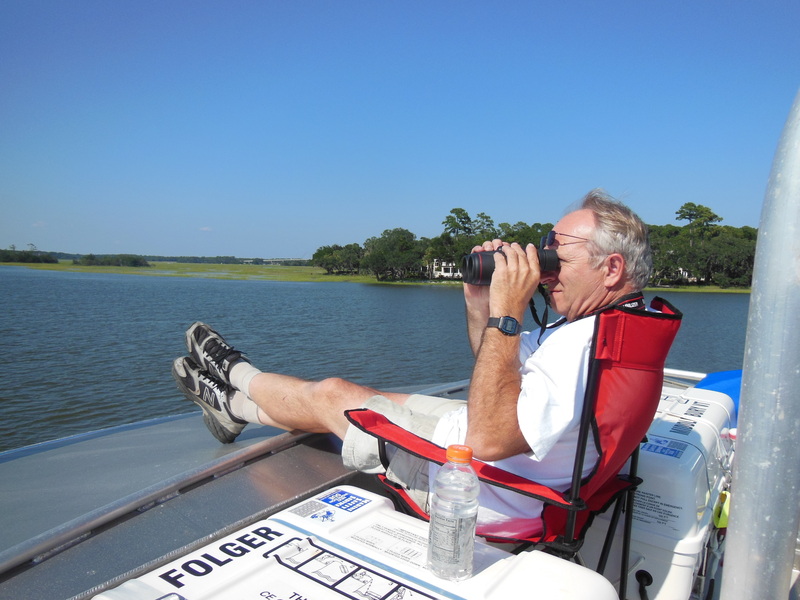 If the Folger is in the ICW, then the AIS doesn’t track the vessel. It seems to track only vessels that are in open ocean. The cargo ship Panthea is now at Port Everglades, Florida, and the R/V David Folger will be off-loaded Wednesday morning. Capts. Tom Manley and Richard Furbush, along with electronics specialist Chris Goodrich, are ready to start the first leg of the journey to the north after the Folger is outfitted and fueled, and basic mechanics are tested. Mate Pat Manley will join the crew in North Carolina in a few days after attending an NSF panel in Washington, D.C. Wish the crew smooth sailing and keep watching for updates daily!